Abused, battered and bruised, scratched, dented, overworked and generally badly maintained, a forklift’s lot is often not a happy one.Which is strange when you consider that if the forklift in your warehouse isn’t operating, chances are your warehouse isn’t, either. This writer remembers well the sound of a pallet of pet food crashing to the floor from the raised ramp of a delivery truck. Most of the pet food was canned, 24 cans to a cardboard tray—each tray wrapped in clear plastic. In the early 30's it was a couple of days work for several men to unload a boxcar of canned goods. But the same task took only a few hours following the advent of wooden platforms (pallets) for stacking goods, and the associated machinery (forklifts) with which to move them. Try to export goods using wood packaging materials (WPM), that are not HT ISPM 15 compliant, and the repercussions will prove costly in terms of fines and delayed or even returned shipments. At L.C.N. 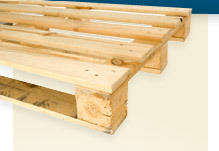 inc., we specialize in the manufacturing of loading pallets and wooden crates. We offer an unlimited amount of models and will custom-make pallets and crates to meet your needs. L.C.N. inc. is fortified with the knowledge and expertise acquired through more than 50 years of manufacturing millions of pallets, and we continue to maintain high standards for quality and excellence. Today, we combine our flexibility, reliability and performance in our constant goal of manufacturing wood pallets and crates that will meet the requirements and needs of our customers' needs. Doing business with L.C.N. inc. allows your company to move forward through our offer of first quality products, reliable and personalized service, as well as quick turnaround to your requests. At L.C.N. inc. we offer just-in-time delivery, providing you with the pallets or wooden crates you need when you need them. We are able to store thousands of products specifically designed for our customers, which enables us to supply our customers with the products they need and require in virtually no time. © LCN Pallets and Wooden Cases 2008 | Site map . Legal notes . Managed by Synovatec inc.